All seventeen Chris-Craft models for 2011 from twenty to thirty-six feet in five series have standard or available wood inlays or appliqués to remind the admirer of the rich 137-year history of this boatbuilder which started with wood craftsman, Chris Smith developing his first engine-propelled boats and skiffs back when Henry Ford was popularizing the motorcar. 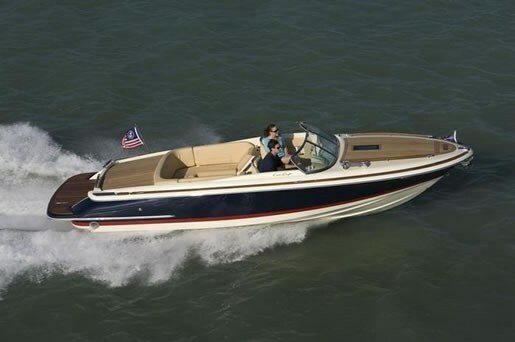 The Corsair 25, one of four in the Corsair series, is as reminiscent as any of the Chris-Craft design heritage with its steep-angled prow, flared bow, rear-angled transom, generous use of wood inlays, and even a hint of tumblehome toward the stern. The Corsair is a most modern iteration of the glory days of the past. All Corsair models are cuddy cabins with V-berths, a useful area for changing clothes, for readily accessible dry storage, for a play area for the kids, or for comfortable snoozing out of the weather after an exhausting day of play on the water. The Corsair 25’s cuddy has a portable head standard. The cockpit of the Corsair 25 is, next to its overall design, the boat’s most remarkable feature in, not so much its layout, which itself is huge, practical, and useable, but in its choice of materials, colours, accessories, design, and execution plus a generous use of polished stainless steel everywhere you look. Understated elegance is perhaps the best description of all. The entire cockpit appears as one flowing design from the dash back through the lounge seating to the full-width powered engine hatch to the huge integrated swim platform. And all flat surfaces can be covered in extra teak to preserve the “traditional” look. The helm and passenger “chairs” are substantive looking yet modern adjustable. The U-shaped lounge with full side bolstering covers the balance of the cockpit surround and has angled backrests on both forward ends. The modern double-stitched vinyl feels buttery soft yet is firm for proper support. Even the choice of available colours hints subliminally at aristocracy and wealth. But more practically, available storage for use and enjoyment of modern on-water necessities is abundant from a foredeck anchor locker, to an in-floor cooler, ski storage locker, side storage areas and under the seating. The helm itself is unique and beautifully crafted with its tilting custom mahogany steering wheel to the custom Chris-Craft gauge package. Trim tabs are standard as is a pressure water system, dual stainless steel trumpet horns, stainless steel transom shower, a Kenwood AM/FM/CD stereo with subwoofer and tweeters with an in-dash remote, and of course a bow staff with a custom Chris-Craft embroidered pennant. A bimini top and stainless steel ski tow are also standard. You can dress-up your Corsair 25 with many choices of accessories to suit your own tastes and desires. Go for the thee-piece sunpad cushions with storage bag, or the air compressor for your inflatable watertoys, or perhaps LED bow docking lights or underwater lights. A stainless steel drawer refrigerator is also available along with much, much more. Three choices each of single Volvo Penta or MerCruiser dual propeller gasoline and two Volvo Penta diesel sterndrive propulsion packages ranging from 260 to 400 horsepower are available for the Corsair 25 and its modern deep-vee hull design. The standard engine package is the Volvo Penta 5.7L Gi/DP at 300 horsepower. 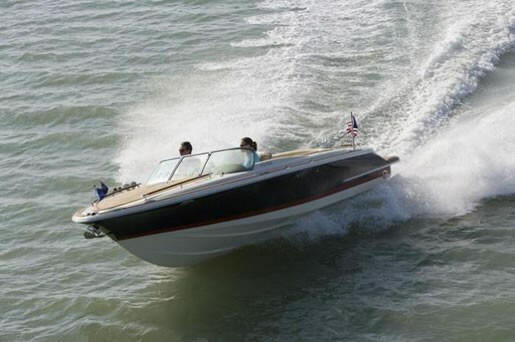 Chris-Craft reports that the Corsair 25 equipped with the upper range Volvo Penta 8.1L Gi/DP of 375 hp produced a top speed of 53 mph and an optimum cruise speed of 23.2 mph at 2,500 RPM, allowing for a cruising range of 222 miles or 357.3 km. Chris Craft’s Corsair 25 embodies the beauty, elegance and classic reminders of yesteryear combined with modern materials, engineering and construction all assembled and presented in an outstanding symmetry of sensual and perceptual overload. The presentation is all-consuming.